Gotham Bar and Grill 35 Years Old: Impossible, You Don’t Look a Day Over 29. 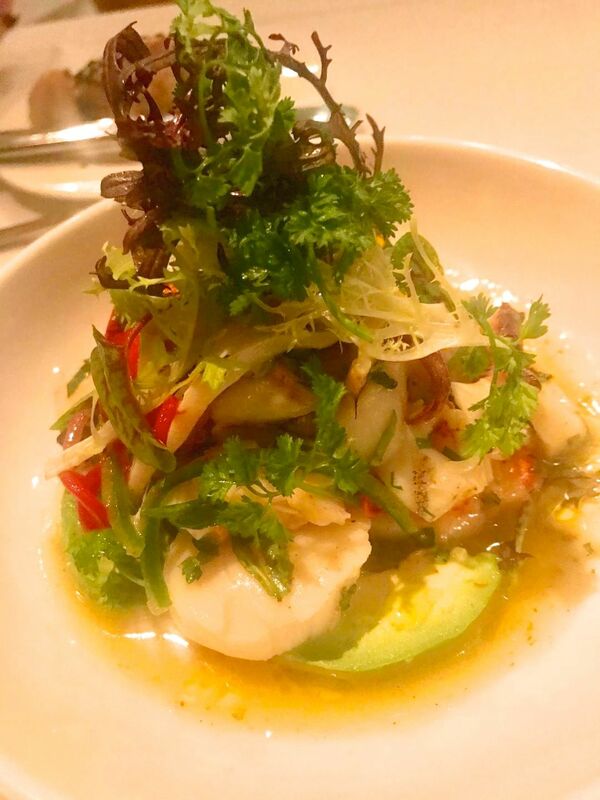 Here’s the 2019 version of Portale’s celebrated seafood salad. Photo by Dana Stoddard. I’m not sure what happened to my brain this week. My niece Dana and I arrived at Gotham Bar and Grill Monday for a birthday celebration dinner with Jerry and Dorothy Kretchmer to discover we were a week early. We decided to stay for dinner anyway. One of the first of the city’s Grand Cafés (and possibly the sole survivor of the era) the room looked wonderful -- the same only lighter. A gorgeous platinum blonde. 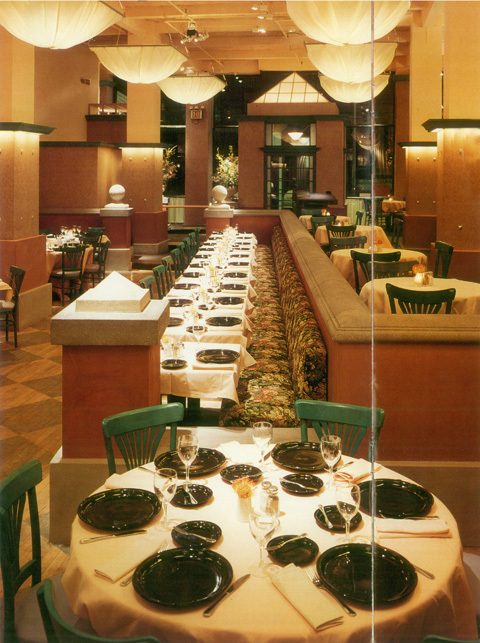 This was how Gotham Bar and Grill looked in 1983. The original ceiling clouds were yellow last time I noticed. Now they are a rich banana cream pie. And photographs chosen by chef-owner Alfred Portale replace whatever was on the walls in 1984 -- I don’t remember. Dana and I shared the roasted squash salad -- a sparkling pileup of tender butternut chunks with frisée, cranberries and pumpkin seeds -- and the seafood appetizer. 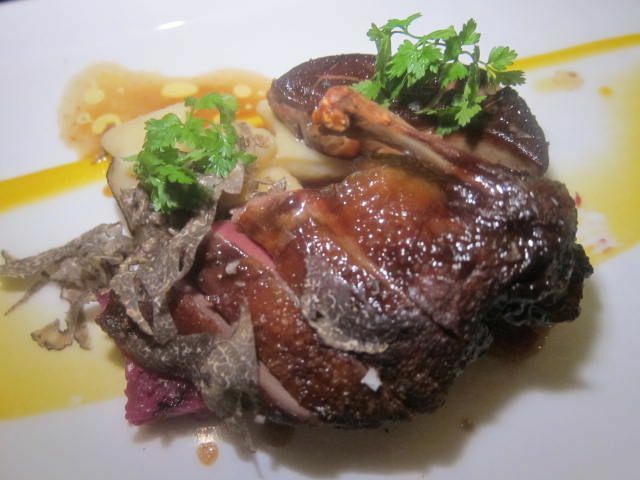 I can’t possibly add up all the times I’ve chosen the squab – rare, please – for my entrée. If you are old enough and a regular here, you may remember the historic ups and downs of the seafood salad. How tall it once was, with a plume that nearly reached your nose. Tonight, it’s a luscious gathering of lobster, scallops, shrimp, bits of octopus and calamari with avocado -- the seafood wonderfully fresh and exactly the right temperature, delicious but not overly Glennclosian. 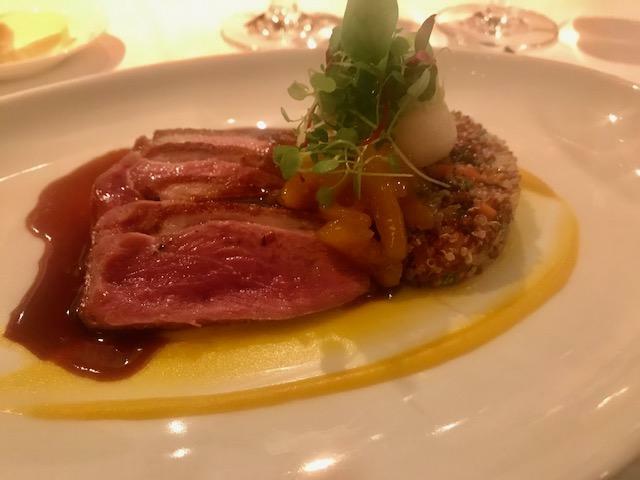 This is the duck that my niece Dana and I shared on the evening we found ourselves a week early at Gotham. I finished two yeasty, seeded rolls and the attentive little bread server tried to deliver a third, but I held back. Even so the two of us passed up dessert, knowing we’d be back next Monday evening to launch the Gael Greene week when the kitchen will do classic dishes from my earliest reviews. We’ll celebrate with dessert then. 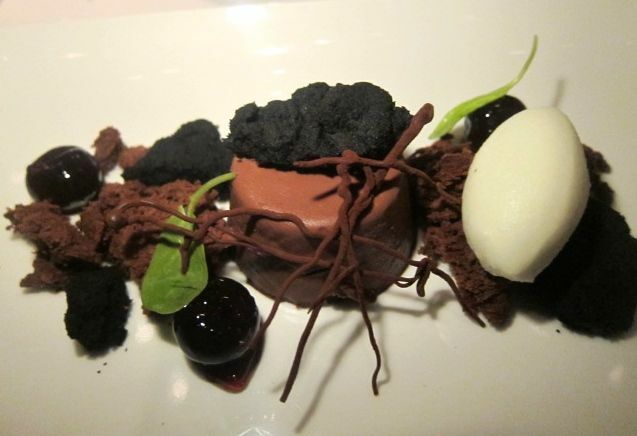 This is a photo of the chocolate cake at Gotham, vintage 2014. This April Gotham Bar and Grill is celebrating 35 years on 12th Street with a special month long celebration. Starting Monday, April 1st, we celebrate the “Original Influencers” -- four extraordinary food writers who championed the restaurant over the years and have helped secure Gotham’s legacy. 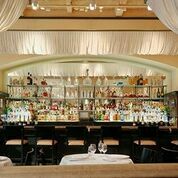 Each week we’ll offer a set four-course menu for $84 celebrating a notable food critic, their review of Gotham, and the dishes they loved. A limited number of tickets are available via Tock on the Gotham website. 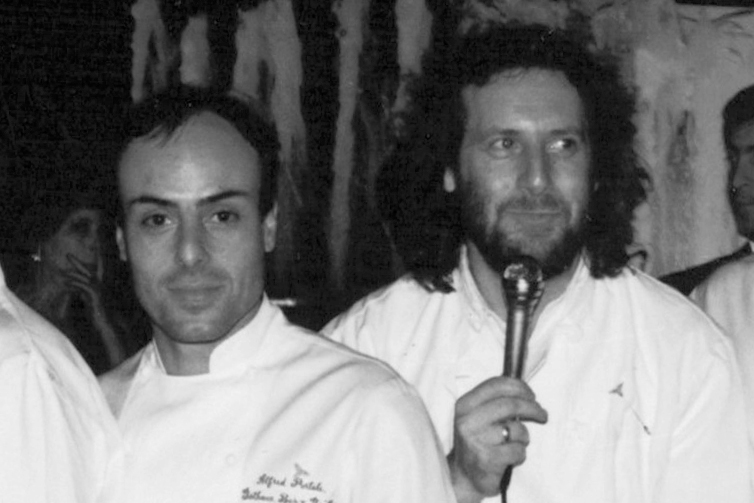 Jonathan Waxman suggested to Gotham partner Jerry Kretchmer than he hire Alfred Portale to save the day. “A warning to readers cast a pall over the Gotham, but it also triggered a drastic overhaul,” I wrote... “And now happily the Gotham has found a new chef with talent worthy of its prizewinning architecture.” I came for lunch. “The best goat-cheese-and-lardon salad I’d eaten in New York,” I reported: “Warm lamb salad -- the meat rare with a savory caramelized edge. Deep-fried salsify and the kind of baby vegetables fussy chefs insist on these days…do all the dishes look beautiful? That’s because Alfred Portale was a design major at college for Larousse Gastronomique and did stints at the Troisgros Brothers and Michael Guérard in France. A portrait of the Gotham sole at my birthday dinner in 2012. “When Alfred Portale came to the kitchen of the Gotham Bar and Grill, fresh from the orbit of France’s brilliant chef Jacques Maximin, his idea of a sauce was buttered broth. Portale slithered through twenty pounds of butter a day. Then, gradually, he began to favor vinaigrettes and vegetable purées beaten into olive oil -- creamy emulsions without cream. Now he’s started to think about his own health, his family’s cholesterol history. And it’s easier than ever to diet at the Gotham. “If you’re counting calories as well as fleeing from fat, an appetizer -- seafood salad, warm skate with capers and grilled red onion, or marinated mackerel -- plus garden salad and berries is dinner. (Ask for half the usual amount of vinaigrette on everything -- or get vinaigrette on the side, dip your fork, and sprinkle. Click here to read Eating Healthy. 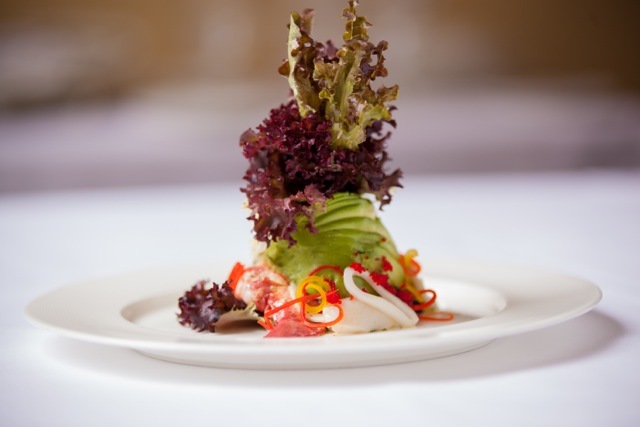 The original seafood salad recreated in its full plumage and couturier dress, 2013. In 1995 Portale’s obsession with the sculptural look of the plate had inspired other chefs to think tall. That led to my report, “Tall Orders.” Click here to read it. “A teetering tower of chicken parts and deep-fried wonton, sky-high feather dusters of hothouse lettuces. Spikes of fried epazote, thickets of thyme, chive knitting needles that tickle the ceiling. A flying buttress and striped columns of chocolate. The tallest seafood salad in history. 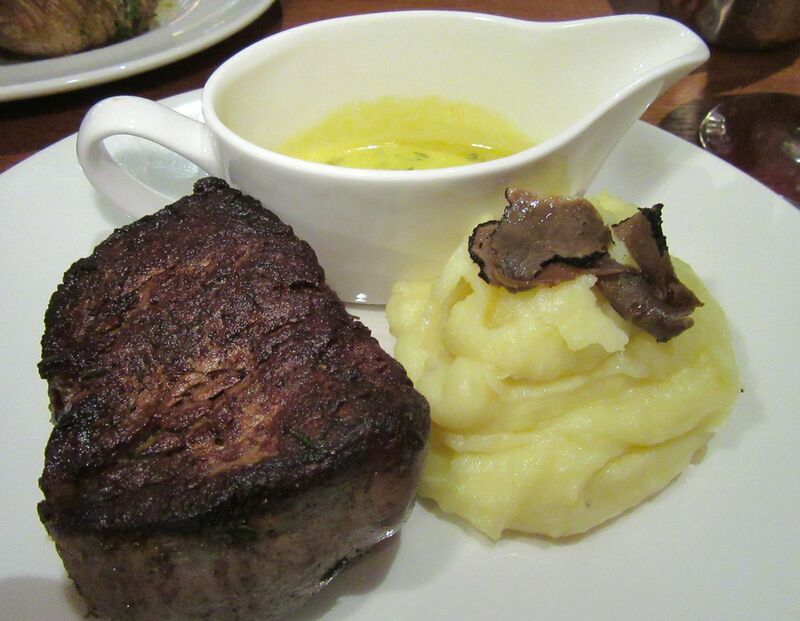 Fancy American food -- already aggressively muscular -- seems to be growing ever taller. I do appreciate a sprightly salad, but must it leap up and tap dance? 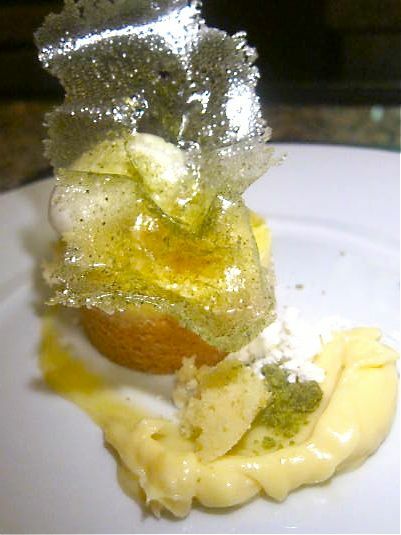 Do we need a demolition permit to tackle dessert? Am I imagining I hear the ghost of Escoffier groaning? Or was that a giggle? Is this serious? Or fun? Or downright silly? Yes. Yes. And yes. The original seafood salad took on more horizontal leanings in 2013. 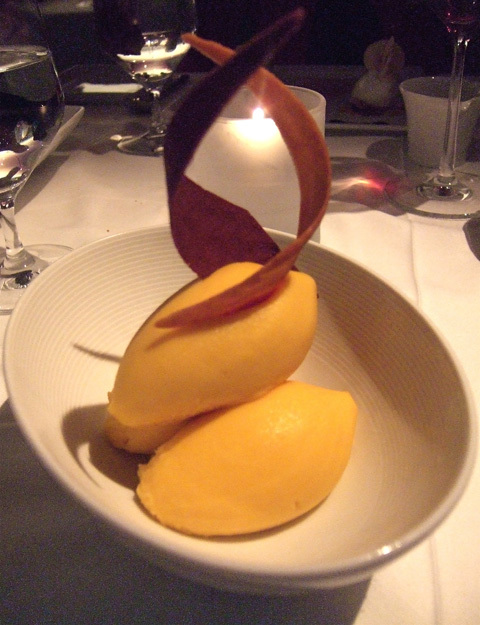 The dessert chef expressed himself with sorbet in 2009. 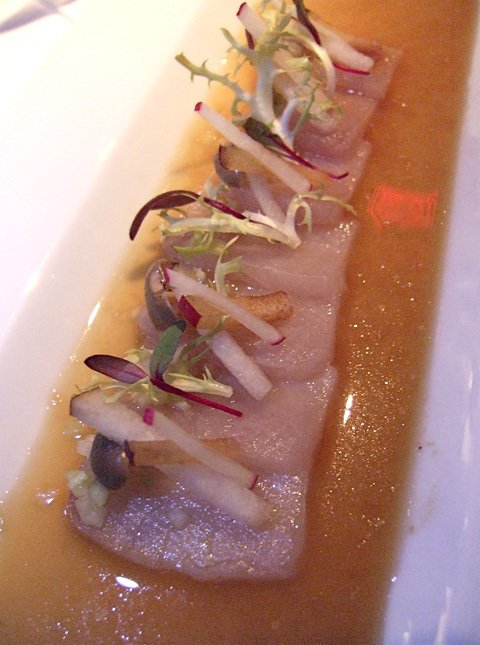 Gotham sashimi has a rosy glow in a photograph from 2009. “I can't quite believe they're Martians. I suspect they're simply geographically repressed. They want to know my favorite restaurant, and when I say, ‘the Gotham,’ they stare blankly. ‘The Gotham Bar and Grill,’ I say, 12th Street.’ Noses wrinkle. Jaws tense. It's not as if I've said, ‘under the abandoned el in the South Bronx,’ or ‘two doors down from the sewage plant on Avenue C.’ But that's the way it is on our island, chockablock with the odd and exotic and homey. “For some mouths, Mortimer’s is the center of the universe. Or Le Cirque. Or The Grill at the Four Seasons. There's a certain phylum of New Yorker that cannot travel below Saks. Blinded car windows were designed for their safaris to Bouley -- while we happy tribes invade far-off Zip Codes, stalking the perfect dumpling. 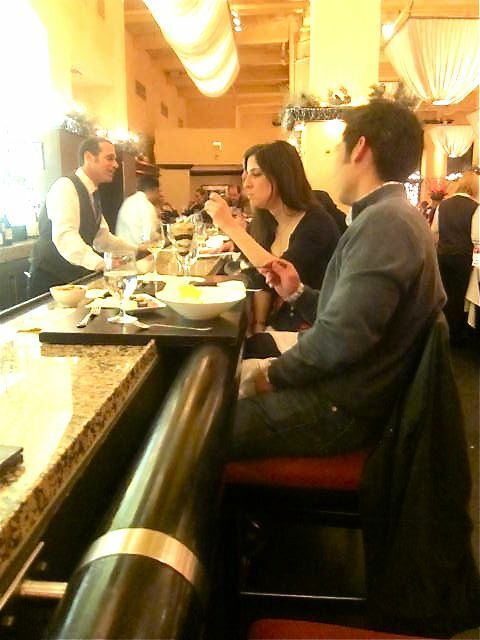 The bar draws regulars as a place to meet before dinner or for solo dining. “I'm so busy keeping my own mouth current that I don't get to the Gotham that often. But now that chef Alfred Portale is racing back and forth from his new One Fifth, it's the perfect moment to see how a longtime favorite endures. When Portale created the bar menu he designed wooden boards to make bar dining more comfortable. “As always, the excursion starts on a high. The sidewalk's nighttime murk opens to a buzz of theater, three levels creating runways for people-watching; strivers, achievers, politicians, their chroniclers, the neighborhood. A bar for flirtations, sometimes poutful waits (one flaw here), and B-minus nuts (is the mix top-heavy with peanuts, or is everyone like me, devouring the almonds and cashews?). The infants and toddlers who were welcome at six are gone now. And the soaring space feels fresh, with its classic forms and witty garden ornaments, its brilliant lighting, and its floating parachutes to muffle the sound. 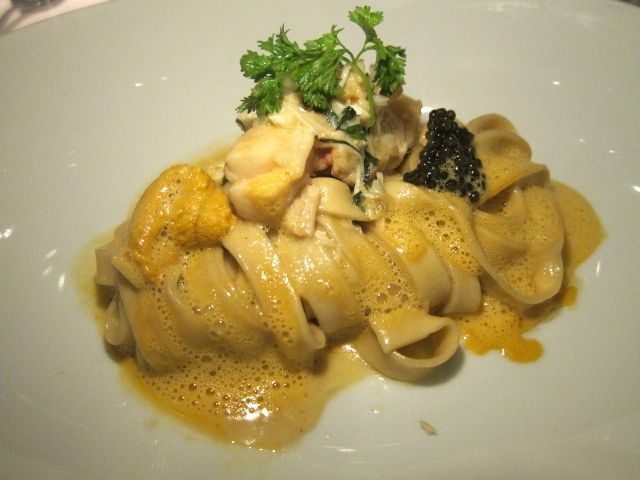 Sea urchin and caviar flavor a saucey seafood fettucine in 2014. “The years have worn the clever stenciled floor (watch out, it can be slippery), but the room's subtle grays, greens, and terra-cotta, the pediments and globes, still work. 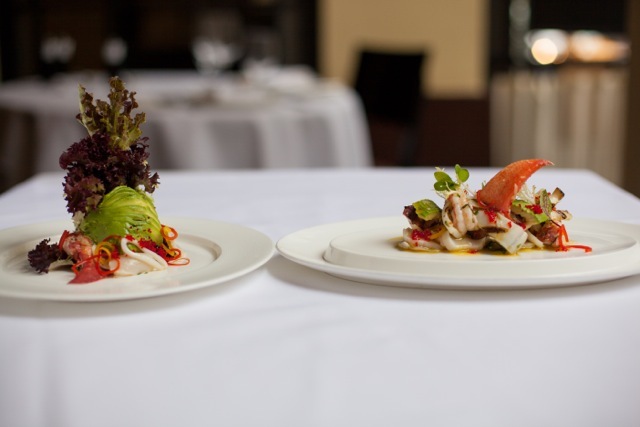 So does the service, growing slick to match the intensifying sophistication of Portale's cooking. He's a teacher. Gotham alumni tend ranges around town, to unanimous praise. 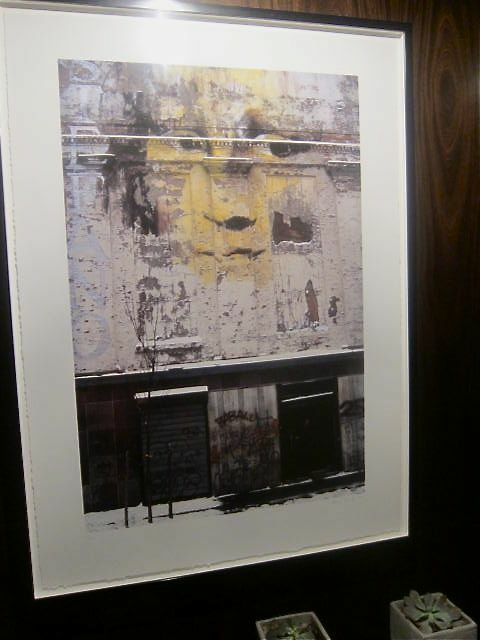 The Mona Lisa image on a building by my guy, Steven Richter, hangs at the end of the stairs to the lower level. “Tonight most of the starters sport feathery lettuce headdresses. The table looks like the annual Indian Nations Pow Wow at Taos. Pappardelle ribbons swirl high like a futuristic tower, with herb-twig antennas. And sundaes scrape the sky with pastry turrets. Edible architecture. 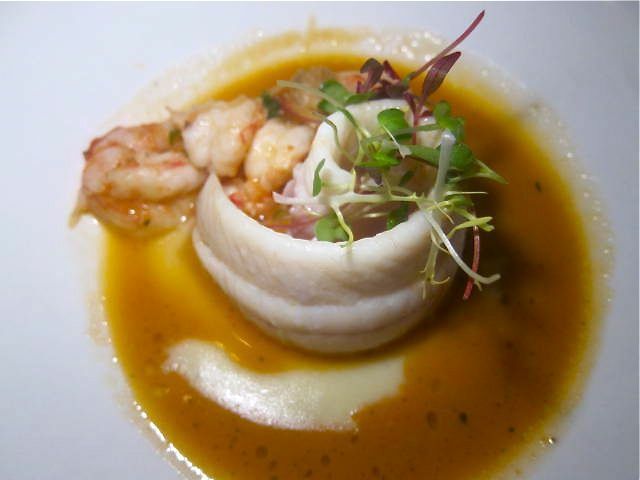 Halibut balanced on halibut with savory vegetable mortar and herb tassels flying. Sure, we giggle, but it is almost always…so very good. 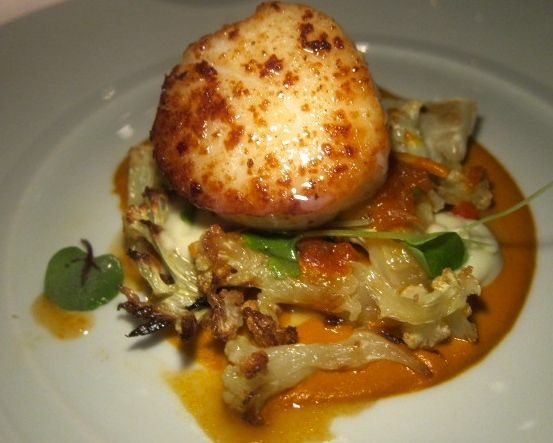 A giant seared scallop and cauliflower from 2014. 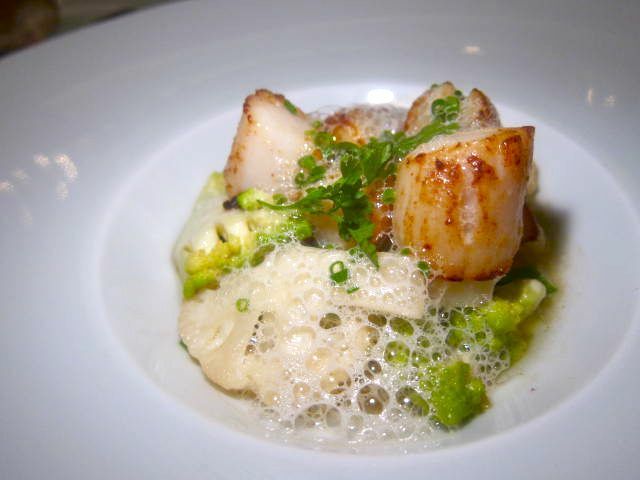 Gotham scallops at my birthday dinner in 2012. “Portale is not one of the wunderkinds reinventing the chicken. Go elsewhere for pork cheeks, beet-tinted mashed potatoes ringing the plate, or birds wrapped in Indian pancakes. He's too pure for that, too hooked on the classic, too focused on the perfection of the product itself. That’s why you could eat at the Gotham every night of the week and never get zonked by sensory overload. He's not Picasso or Van Gogh seeing the world as it has never been seen before; he's a grand portrait painter, glorifying what is.” Click here to read Gotham: Grill Crazy. 12 East 12th Street between 5th and University Place. 212-620-4020. Lunch Monday - Friday noon to 2:15 pm. Dinner Monday-Thursday 5:30 pm - 9:45 pm. Friday 5:30 pm - 10 pm. Saturday 5 pm - 10:30 pm. Sunday 5 pm - 9:45 pm.